Interesting Facts: As Mega Lucario, its cream fur becomes longer, and its thighs slim down. It develops more spikes on the back of its paws, of which have turned crimson. Its aura-sensing appendages grow longer, and two of them are tipped in crimson. Its shoulders also possess a spike each. 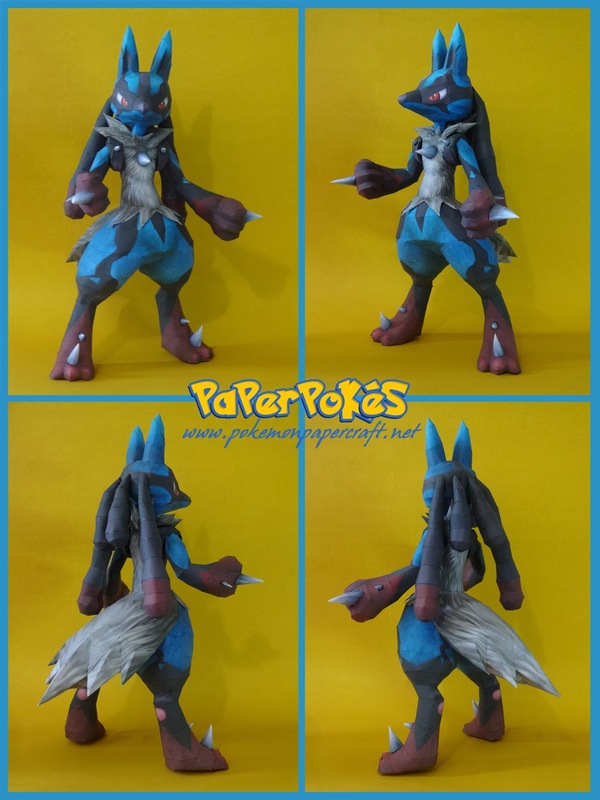 Its aura heightens throughout its body, which formed black markings on its blue fur. NOTES: This model has two main start points: the ears and the spike that goes inside the chest. The head is closed at the spike at the bottom and the body is closed at the bottom of the toes. There is a time to glue everything to it, in a way that the parts won't stay in the way while building, the order indicated by the numbers provides this. Also, there are a lot of lines to be folded on this one, they are indicated by red lines on the pdo, fold them smoothly. The hardest part is the neck fur, take your time there; fold the lines, follow the instructions and the numbers and it will build pretty well. Plenty more info included on the template, along with colored tabs to guide your build, but the use of the pdo is still indicated. this is so awesome!i did not expect a mega so soon!thanks so much! Printing this first thing tomorrow. 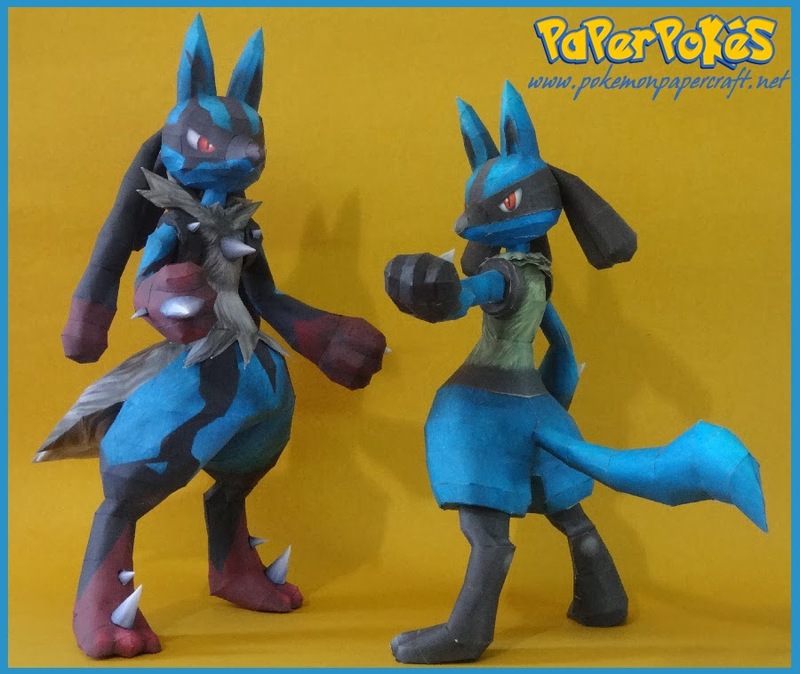 Lucario has been my favorite ever since the Lucarioand the mystery of Mew movie. Once I saw Mega Lucario, I had a fangasm <3 And now, this. I have NEVER been so excite about ANY papercraft EVER in my life. You guys mean the world to me! Thank you from the bottom of my heart. I still only finished the head today, but U'm a bit concerned about his balance. Does he sand on his own or are there any tricks that can be done to make him stand withouth a base? To make the model stand without a base(If it doesn't stand already) you can put weights in the feet, like coins. Just print out the base separately, and possibly adjust the size to fit the different model. No, it won't stand on it's own, I used some coins in the feet, toes to be more exact. The inctruction relative to this is included on the template, last page, with some other notes about the model on ther other pages. Really Amazing!!!! But waiting for Ninetales.. I SO WANT TO MAKE THIS NOW!!! Nice! Will you desing Greninja soon?